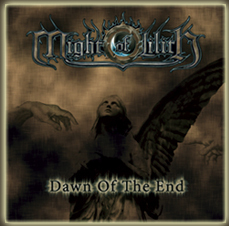 Might of Lilith was formed in March 2003 by Eugen Leis with the intention to create dark atmospheric music which is heavy and melodic at the same time. Shortly after, the keyboarder Anna Leis, who is now preparing for her piano studies, joined the band. Quickly, the style of the music has been found and the first songs were written. a former student of Victor Smolski, shared in. In summer 2005, the band entered Klangschmiede Studio E to record a Maxi-CD in cooperation with Markus Stock and Tobias Schönemann (The Vision Bleak, Empyrium). The result of their first recordings was very satisfactory for both parties, the release is scheduled for 2006. Might of Lilith were well received by the public on gigs in the region of Stuttgart (among other with Skyforger (LV) and Sear Bliss (HU)), as well as on Metal Battle 2005, the Wacken Open Air Newcomer Contest in the Rockfabrik Ludwigsburg.